We always want to give back to our loyal players, so we have finally implemented this wonderful and useful feature: free SoBucks for every daily login! With this feature, new players who are still familiarizing themselves with the game, will have at least some spending money while leveling up to get a job or waiting for their job application to get approved. And to those who are saving to get that sweet, sweet boat — try to hit the jackpot and get that rare 100 SoBucks login prize! I bet every SoBucks help is welcome. So how do you get free login SoBucks? Simply login to your account and you’ll get some SoBucks once a day after logging in. How much SoBucks can you get? The SoBucks prize you get is random, and the 100 SoBucks prize is pretty rare, but who knows, right? Login away, folks! Enjoy this while it’s here. 2014 PR Giveaway winner: Sumayyah. Click to see the image in a bigger size. It took a while for us to announce this, as it’s quite a big announcement, but the winner is finally here! 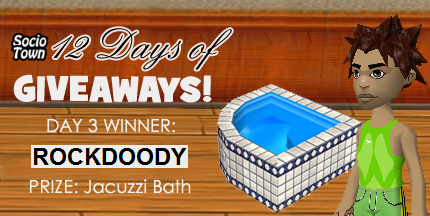 Congatulations to Sumayyah, 2014’s PR Giveaway Winner! We will activate her one-month PR subscription this weekend, as our winner is finally free from her exams. It sure is good to unwind in SocioTown after tackling school work and chores! Remember to maintain a good balance of school work, chores, outdoors and SocioTown, kids. 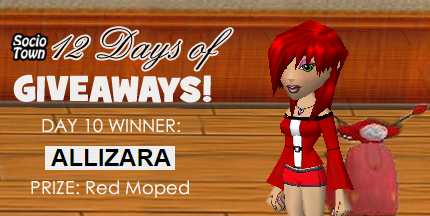 Travel around town with your shiny new Red Moped, Allizara! It seems red is your lucky color. 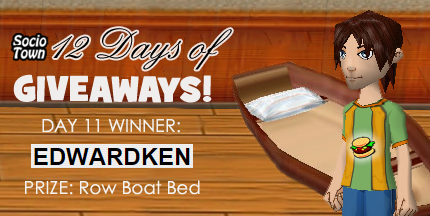 And our next winner is… EdwardKen! And his prize? Oh, you know, it’s just the REALLY RARE ROWBOAT BED! May the (imaginary) feel of the river flow sway you to majestic sleep, EdwardKen. 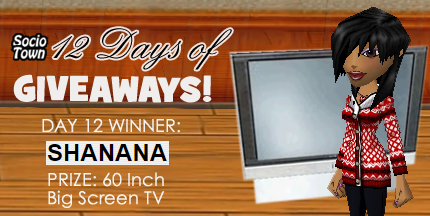 And our 12th and final winner for 12 Days of Giveaways is (drumroll please) Shanana! She gets the enormous 60 Inch Big Screen TV. I suspect Shanana can build a mini cinema now with the other Big Screens she has. Congratulations to you all and may you enjoy your prizes! Thank you for participating in SocioTown’s 12 Days of Giveaways. See you next December for more giveaways and awesome prizes. 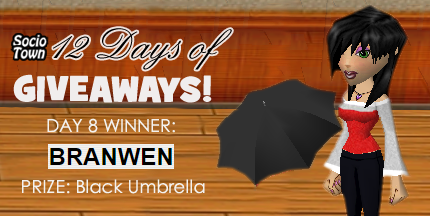 Our 8th winner is Branwen! And she gets this stylish accessory–the Black Umbrella. I must say, the item matches her outfit quite well. I know someone who will sleep like royalty tonight. 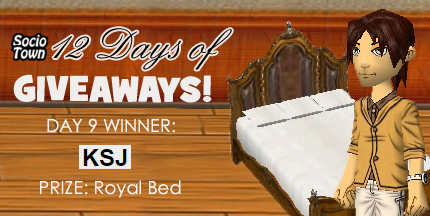 Congratulations to KSJ with his new Royal Bed! Day 6 has PirateEmo as its winner! 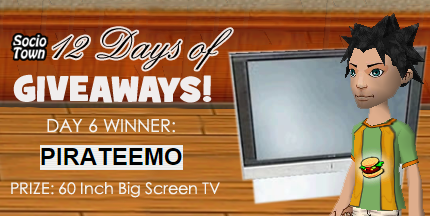 Make way for your gigantic prize, PirateEmo–make way for your new 60 Inch Big Screen TV! 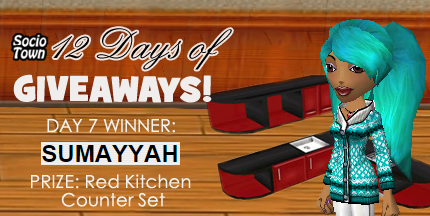 As for Day 7, a round of applause for… Sumayyah! A red-themed kitchen or dining room? With your new Red Kitchen Counter Set, why not, right? SocioTown’s 12 Days of Giveaways is still on-going. To join, please visit sociotown.com/blog/contest for more info. 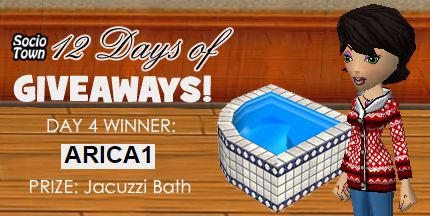 Day 4 & 5 Winners: Arica1 and Berta12! And our day 4 winner is (drum roll, please, tin soldier)… Arica1! Enjoy your new Jacuzzi Bath. I hope this brings warmth and energy to your Socian this holiday. 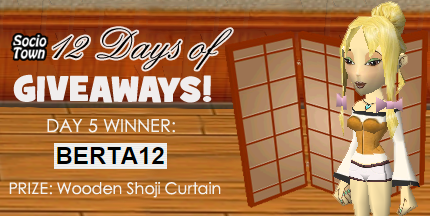 ‘Tis the season to be jolly for Berta12, since she is our day 5 winner! You get to have this handy and classy room divider, the Wooden Shoji Curtain! Both gifts should be in your inventory by now. Have a merry-tastic weekend, everyone! Using RANDOM.ORG’s list randomizer, the first winner for 12 Days of Giveaways has been determined. Congratulations to AREESH! 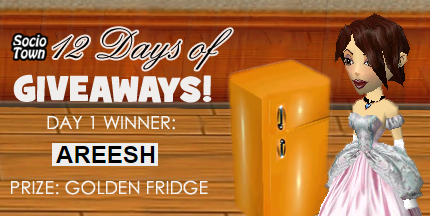 You will get your Golden Fridge real soon. To win a prize, you can join by simply liking SocioTown’s Facebook page, liking the contest banner, and adding a comment “Pick me, SocioTown Santa!” with your full SocioTown name. 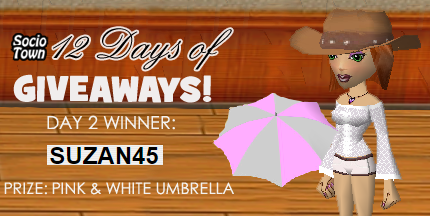 One winner will be randomly picked everyday, from 21st of December to January 1st! The winner for December 22 will be picked after the day’s done.